Octave – Simple or Compound? An Octave - Simple or Compound? When is an octave a Simple Interval and when is an octave a Compound Interval? Judy Hanley is an amazing UMTC Teacher (Ultimate Music Theory Certified Teacher) and runs a very successful teaching studio in New York! 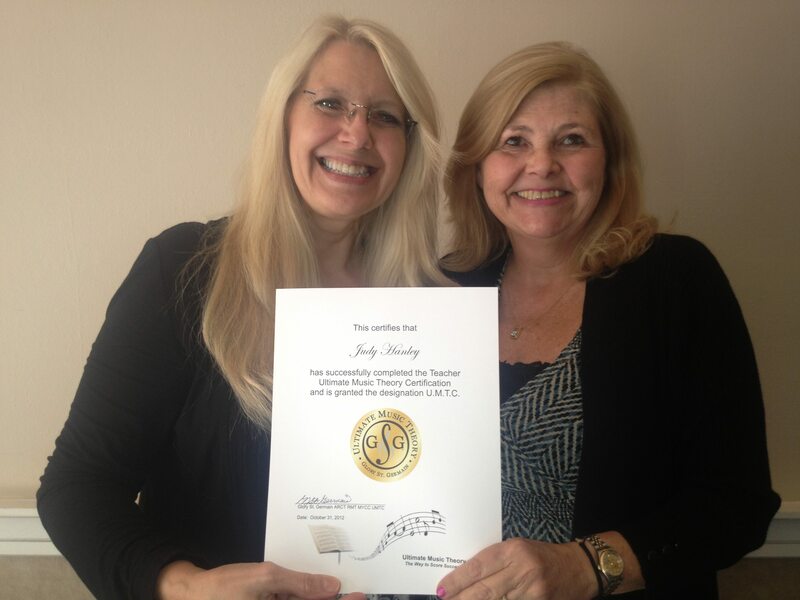 Glory St. Germain presented Judy with her UMTC Certificate upon completion of the UMTC Course. Judy recently sent me an email to ask why the interval of an Augmented 8 inverts to a diminished 8 (and not a diminished 1) but a Perfect 8 inverts to a Perfect 1. This is an excellent question and one that I actually struggled with "BUMT" (Before Ultimate Music Theory). Simple or Compound - What's the Difference? In order to answer this question, let's first review the difference between a Simple Interval and a Compound Interval. Intervals are introduced in the Basic Rudiments Workbook on Page 59. Simple Intervals are all the intervals between a Perfect 1 and a Perfect 8. The smallest interval possible is a Perfect 1. There is no such interval as a diminished 1. Why is there No Diminished First? Please read my Blog - No Diminished First! In the Advanced Rudiments Workbook on Page 41, we begin to learn the difference between a Simple Interval and a Compound Interval. Compound Intervals are all the intervals between an Augmented 8 and a Perfect 15. Pop Quiz - Simple Octave or Compound Octave? Here are two Octaves. Can you name these intervals? Can you name and write their inversions? Which interval is Simple and which interval is Compound? One way to tell the difference between a Simple Octave and a Compound Octave is to invert them. A Simple Interval will invert with a movement of one octave (a one octave movement). A Compound Interval will invert with a movement of two octaves (a two octave movement). Moving the Lower Note one octave higher. Moving the Higher Note one octave lower. Either movement of one octave will cause the Lower Note and the Higher Note to switch places (which is the essence of inverting an interval!). Moving the Lower Note two octaves higher. Moving the Higher Note two octaves lower. Moving the Lower Note one octave higher and moving the Higher Note one octave lower. Any of these 3 options will cause the Lower Note and the Higher Note to switch places! Therefore, Interval #1 (the Perfect 8) is a Simple Interval and Interval #2 (the Augmented 8) is a Compound Interval. Compound Intervals - Why a 2 Octave Movement? Let's invert an Augmented Octave in "slow motion" (one step at a time) to prove that we need a two octave movement to invert a Compound Interval. As we see on the keyboard, this interval is one semitone larger than the Perfect Octave, so it is a Compound Interval (an Augmented 8). Hmm - do you see the problem? The Lower Note is still C and the Higher Note is still C Sharp. They have not switched places yet! A one octave movement did not invert our notes. So, we need to move a second octave, as shown below in Step #3, in order for the inversion to take place! Finally! We now have "proof" that an Augmented Octave is a Compound Interval! It was only able to invert by a two octave movement! When a student struggles with inverting their intervals, I find that one way to help them is to have them always identify the Lower Note and the Higher Note. This way, students do not struggle with thinking that the Interval is based on the "first" note (a common problem). It doesn't matter whether the interval is Harmonic, Melodic ascending or Melodic descending, the Lower Note will always be the note with the lowest pitch and the Higher Note will always be the note with the highest pitch. Become a UMTC - Ultimate Music Theory Certified Teacher! 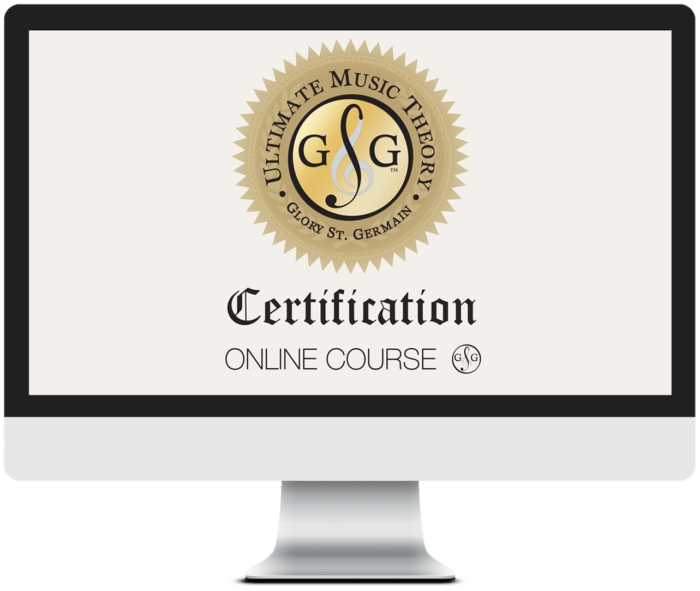 Summer time is the perfect time to register and learn online with the Ultimate Music Theory Certification Course. Pictured L-R (standing in the shade), is myself along with Glory St. Germain. Lounging in front, while studying the UMTC Course is Kay Lang, Judy Hanley, and Charlene Hubbard in sunny Florida! I love that the Ultimate Music Theory Certification Course teaches Teachers how to teach "outside of the box"! In other words, it teaches Teachers how to teach to students of all learning styles so that every student is successful! This Online Pedagogy Course is the only course that teaches Teachers how to teach theory! And, you might just learn some theory yourself. My favorite quote from a UMTC Teacher was "I didn't know that I didn't know it until I learned that I didn't know it". Thanks for the tutorial but I am confused about something. You have said that when you invert an interval, the notes of the interval must switch places, so the bottom note becomres the top note. That makes perfect sense. You also say that when you invert a perfect octave you get a perfect unison. But in this case the bottom note is not above the top note, it is the same as the top note. Surely you need to move the bottom note two octaves up, or move the top not two octaves down? But then you just end up with another octave, which is kind of absurd. Perhaps its a bit meaningless to invert a P8, just as its meaningless to invert a P1? In my 20 years of teaching theory i have never seen this question asked anywhere. Maybe it is only meaningful to invert intervals containing different notes? Hi David! Isn’t that FRUSTRATING!! That Perfect 1st doesn’t really make sense because it is the “same note”! And that is why it is so rare. I guess that we have to start somewhere. I make it a physical thing – I take two lego pieces and print the same letter name on each. Then, we can physically call one the Lower Note and one the Upper Note. This is pre-teaching 2-part harmony when both voices sing/play the same note. Does this help!? Hi Shelagh – the issue for me is this: if we are defining inversion as switching two notes such that the bottom note becomes the top, and the top becomes the bottom, then our definition fails with the perfect octave, because if we only bring the bottom up, or only bring the top down, then we have failed to place the original bottom note above the original top note. What I’m suggesting is that we should just accept that the very notion of inversion does not apply in a meaningful way to perfect octaves or unisons.